Larry Gardner enjoyed a fine Major League career, winning four World Series and finishing with a career average of .289 over 1923 games. 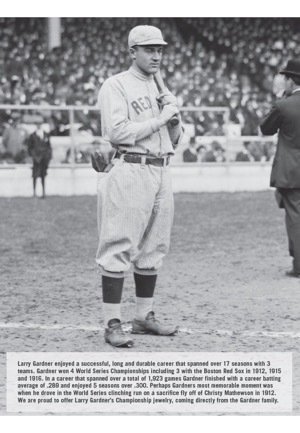 Gardner’s finest season came in 1912 as he was a major contributor to the World Champion Boston Red Sox. Gardner finished 14th in MVP voting and was especially effective in the World Series. During his tenure with the Red Sox, Gardner also was roommates with Babe Ruth. Gardner tripled in the second inning of Game 4 and subsequently scored on a wild pitch which put Boston ahead 1-0 and they ultimately won the game 3-1. In Game 6 Gardner hit a home run. Gardner was the Red Sox hero in Game 8 driving in the walk off run which clinched the World Series. In the 10th inning Christy Mathewson of the Giants walked Duffy Lewis intentionally, loading the bases and setting up a force at every base with the Series winning run on third base. Gardner stepped up to the plate and flied out to Josh Devore in right field deep enough for Steve Yerkes to tag up and score, and the Red Sox celebrated as Champions. Offered is Gardner’s Championship watch fob from that season. Championship rings for World Series victory first debuted in 1922 and became the standard format in 1926. Before that time, pendants and watch fobs were the most common player prize. This World Championship fob came from the Red Sox with his name beautifully engraved on the reverse. This 14K gold medal, with scalloped edges and red enamel trim, features two crossed bats set upon a baseball diamond that includes the year, "1912." 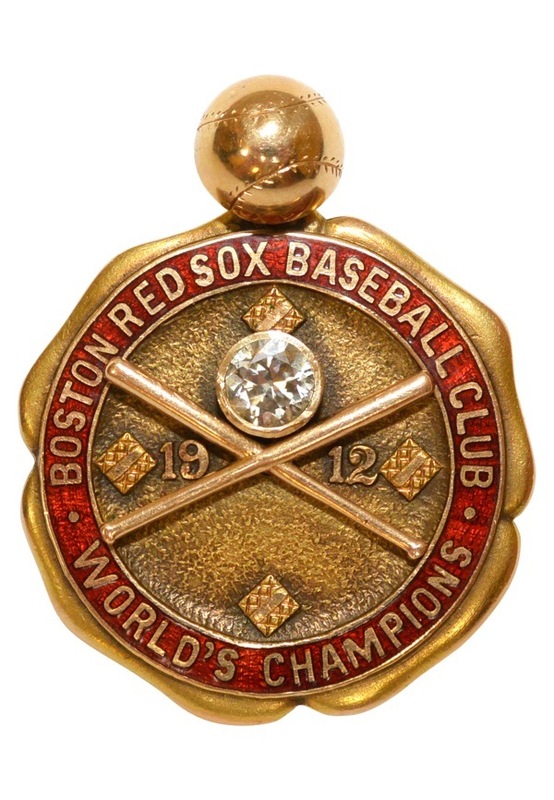 In a circular pattern around the edges reads “BOSTON RED SOX BASEBALL CLUB WORLD’S CHAMPIONS” lettered in gold within the red enamel border. A small figural baseball is attached to the medal at the top to allow for its attachment to a watch fob. 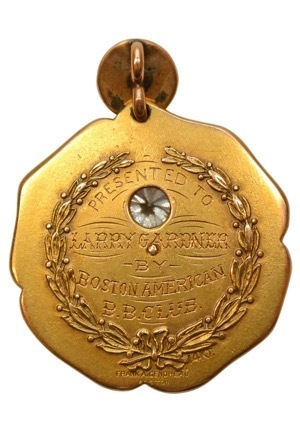 The engraving on the reverse reads: "PRESENTED TO LARRY GARDNER BY BOSTON AMERICAN B.B. CLUB”. Below that is the engraved name of the jeweler "Frank A. Gendreau" and is stamped "14KT." 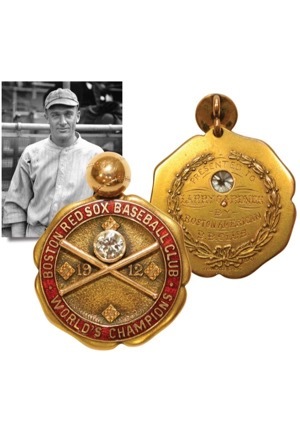 This is one of probably fewer than five 1912 World Series fobs known, one of which resides in the Massachusetts Historical Society, and comes with directly family provenance from the Gardner’s. The diamond in the middle has been replaced. 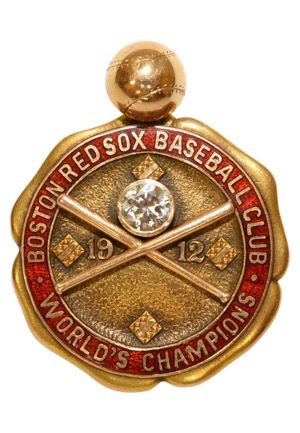 This is an incredibly rare World Series presentation piece commemorating the first of Boston's four World Championships during the decade. Accompanied by a Gardner family LOA.